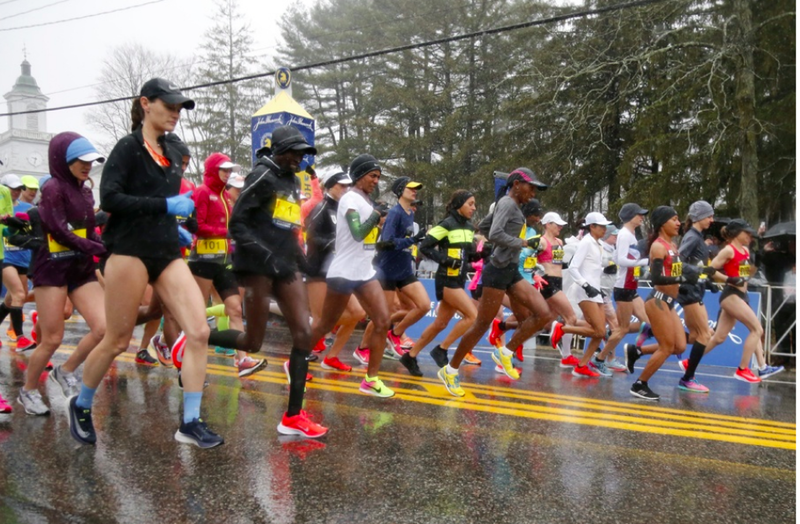 As the elite competitors of the 2018 Boston Marathon endure bone-chilling rain and stifling winds, the U.S. government sits idly by, comfortably prepared indoors and removed from the elements, awaiting their share of the winnings. It is disturbing to think that the men and women who effectively place their health at risk, who compete under the most dire of circumstances, who press the limits of the human spirit, would finish only to be identified by the federal government as debtors to the state. That government bears no interest in any other part of the athlete's heart-wrenching odyssey, yet it is there all the while waiting to assume its part in his crowning achievement, not to extend any congratulations, but rather to deliver the bill. For being the best. For adding value. For winning. Incredibly, this government effectively interprets the athlete's achievement as equivalent to the windfall attending the gambler's roll of the dice. While both of these endeavors always assume a great measure of risk, as the individual assumes at least every participation cost with no guarantee of success, there is at least a potential moral distinction to be proposed in regulating the gambler's activities. The gambler is often the victim of his own addiction, and his fortune is the function of chance. As such, the taxes can be formally placed on an activity which is labeled destructive and merely speculative, where there is nothing more than a value-add from entertainment or pastime. While there are surely a great number of gambling activities which require aptitude, skill and thoughtful strategy, the whole industry tends to be dismissed at the behest of that previous description. Now, the talking heads within government cannot stake those same claims for the athlete who commits himself tirelessly to physical training, refining his skills and strength to win on the day of competition. His performance is not as much the product of luck or fortune, but rather that of consistent training and high-level preparation. What's more, his occupation and winnings exact upon the community no identifiable externalities; on the contrary, the incidental benefit of his performance is visible through the smiling faces which grace the sidewalks, the inspired children who aspire to emulate him, the advancement of the known physiological possibilities, and the followers from home who pledge to undertake their own personal fitness regimen. The many incidental benefits are purely far too numerous to possibly enumerate, as they stretch far too wide and their reach is far too abstract to capture. Moreover, the monetary winnings in this space fall far short of compensating for the hours of exhaustive training and the level of painstaking personal investment required to compete on that stage. Ironically, when comparing monetary returns with the average number of hours committed to this sport by the elite athlete, the mathematical outcome shows a figure which would puzzle the standard statistician, behavioral economist and psychologist. In fact, many of those tax collectors would be surprised to learn that so many of these athletes are employed at a rate even well below the federal minimum wage. Indeed, a great many athletes merely scrape by for years at a time to afford themselves a chance at competing at the highest levels and maybe one day bringing home the big check. As it turns out, most of these athletes compete toward a near-zero rate of return on the investment, meaning that the sum total of their spending either matches or exceeds their eventual winnings. Of course, most of them will never achieve much more than a medal, so the average expected return across all participants is positively negative. For these reasons and for the purposes of liberty, it makes sense only to permit the athlete to retain every penny of his winnings. After all, he is the one who actually earned it. The government officials merely sat on frothy philosophical claims which suppose that they, or their constituents, deserve their fair share. And if so, do we own the product of our labor? If the reader's answers prove to vary across those two questions, neither can be absolutely true, as we must necessarily own ourselves to own the product of our labor, and we must necessarily own the product of our labor to own ourselves. An affirmation for each of these questions proves a necessary condition for liberty, yet only their combined satisfaction warrants the sufficient case. We surely live under a great tyranny when sheer competition, athletic achievement, and harmless exchanges are routinely subjected to the thievery of ornately-dressed men and women hundreds of miles away. Though the men and women who accept these prizes will seldom say anything publicly about this, it is indisputably a great disservice to those who train year round, who test the thresholds of endurance and survivability, and who all the while inspire cities and communities, children and aspirers, and the achiever within all of us. Among these comfortable and well-insulated chatterboxes in skirts and suits, only a limited few will ever develop an appreciation for the remarkable sacrifice, the unyielding determination and the inimitable pride which attends such an undertaking. Because those few mark such a minority, one cannot reasonably expect any change to be made without a fight or a clamor from those among us who truly understand and appreciate such an event, such a pure demonstration of the human will to triumph, and such an epitomization of the unbridled human spirit.